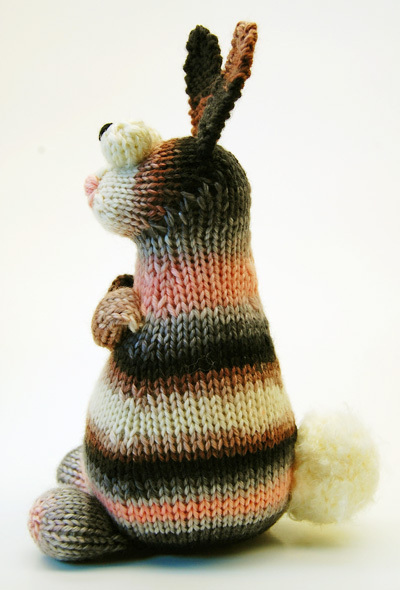 I hear the folks at Knitty are fond of rabbits. 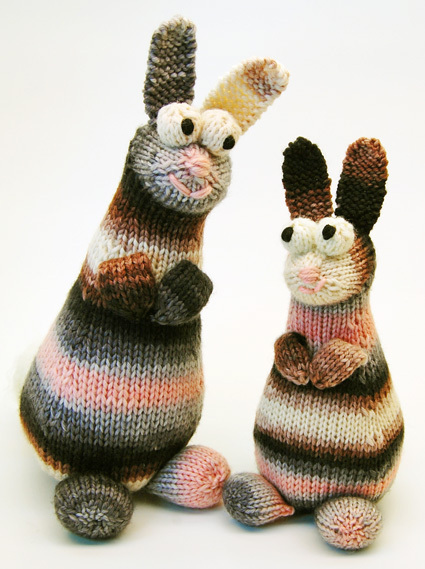 Well, here's my contribution to the lagomorph population: Rabbity, a pair of woogly eyed hoppers in a colorway designed to pay tribute to editor Amy's beloved Newton bunny, a soft grey fuzzball who gave more kisses than any other rabbit in the universe. Don't try to tell her otherwise. These rabbits are easy to make. 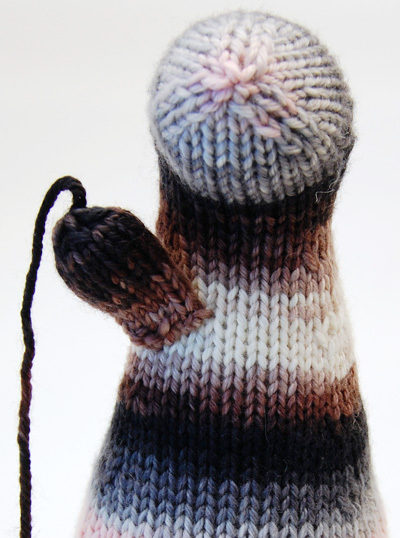 The body and head are knit in one piece, with short rows for head shaping. 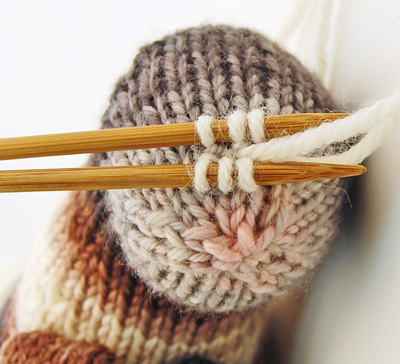 The ears, eyes, paws, and legs can be knit on stitches picked up from the body, or knit separately and sewn on. Each bun takes less than 100 yds, so your stash will multiply into a kissy colony in no time. Don't be put off by the difficulty level -- we've provided alternatives for some of the more challenging bits, and projects like this are an excellent way to try out new techniques. After all, your bun will be so cute that any little goofs won't be noticed. Variable, from itty bitty to big and floppy depending on yarn/needle combination; should fit most rabbit needs. Exact gauge is unimportant and will vary depending on yarn/needle choice, but it must be tight so no stuffing shows through. Using needles a few sizes smaller than those recommended for the yarn will give a tighter fabric. 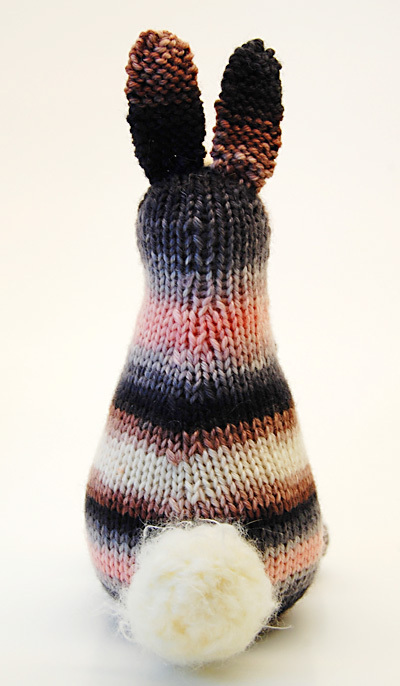 Rabbitty is knit from the base of the body up to the head. The eyeballs and legs are knit on stitches picked up from the body, or knit separately and sewn on. Almost any yarn will work with this pattern. The samples were knit with DK and worsted weight yarn. The pattern only uses less than 100yds of MC and scraps of CC for eyes, face, and tail, so it's perfect for using up odds and ends. Polyfil polyester stuffing is recommend but roving, yarn scraps and plastic pellets would all work (provided the knitted fabric gauge is tight enough). Weighting the bun's bottom isn't necessary; the triangular shape of the base of the body and the way the feet and tail are sewn on make it reasonably steady. Stuff the body firmly, but not so much that the stitches stretch and make holes. The body should be a soft triangular shape, wider at the bottom and tapered at the top. Don't be afraid to work the stuffing with your hands or smoosh it with blunt tools or stab it with pointy needles until it is the shape you want. Treat your stuffing like clay and sculpt it into the desired shape. For the eyes, sometimes it is easier to roll the stuffing into a ball before inserting, and don't overstuff, that's where the stretching is usually most obvious. The paws only need a little -- don't stuff more than half full so it will bend to make the arm part. With MC, cast on 6 st. Distribute across needles as you prefer and join for working in the round. Round 1: Kfb around. 12 sts. Round 3: Kfb around. 24 sts. Round 5: [Kfb, k2, kfb] around. 36 sts. Round 7: [Kfb, k2, kfb] around. 54 sts. Round 9: [Kfb, k16, kfb] around. 60 sts. Round 20: [Ssk, k16, k2tog] around. 54 sts. Round 26: [Ssk, k14, k2tog] around. 48 sts. Round 32: [Ssk, k12, k2tog] around. 42 sts. Round 38: [Ssk, k10, k2tog] around. 36 sts. Round 44: [Ssk, k8, k2tog] around. 30 sts. Round 50: [Ssk, k6, k2tog] around: 24 sts. Row 1 [RS]: K7, wrap and turn. Row 2 [WS]: P4, wrap and turn. Row 3 [RS]: K13, wrap and turn. Row 4 [WS]: P12, wrap and turn. Row 5 [RS]: K11, wrap and turn. Row 6 [WS]: P10, wrap andturn. Row 7 [RS]: K9, wrap and turn. Row 8 [WS]: P8, wrap and turn. Row 9 [RS]: K9, wrap and turn. Row 10 [WS]: P10, wrap and turn. Row 11 [RS]: K11, wrap and turn. Row 12 [WS]: P12, wrap and turn. Row 13 [RS]: K13, wrap and turn. Row 14 [WS]: P14, wrap and turn. Final row [RS]: Knit to end of round. At this point you'll resume working in the round for the head. Continue stuffing head as you go. Round 6: [Ssk, k4, k2tog] around. 18 sts. Round 8: [Ssk, k2, k2tog] around. 12 sts. Round 10: [Ssk, k2tog] around. 6 sts. Cut yarn, draw through remaining stitches, pull tight and weave in ends. Note: the Eyeballs can be a little fiddly, so we've included suggestions for making them a little easier. With CC1, with RS facing, pick up and knit 6 sts on two parallel needles on top of head (see photo at right as a guide for placement). Note: If you find this fiddly, using CC1, CO 6 sts and join for working in the round. Round 2: (LLI, k1) around. 12 sts. Note: if you find this increase fiddly, you can work KFB 6 times around instead. Round 7: Ssk around. 6 sts. If you made the Eyeballs attached to the head, cut yarn and loosely draw through loops, stuff eyeball, pull loops tight and weave in ends. If you made them separately, cut yarn, draw through loops and pull tight. Stuff through cast on end and sew to head. Weave in ends. Using MC, cast on 8 sts. Join for working in the round. Round 2: [K1, LLI] around. 16 sts. Round 4: [RLI, k8, LLI] around. 20 sts. Turn inside out, so that WS is facing. Slip the first 10 sts to one needle, second 10 to another, and work 3-needle BO to close, or BO normally and sew shut. Sew to bottom of body, stuff through toe hole, sew hole shut and weave in ends. Using MC, cast on 4 sts. Do not join -- ears are worked back and forth. Row 2 [RS]: K1, kfb, k1. 6 sts. Row 23 [WS]: K1, ssk, k2tog, k1. 4 sts. Row 24 [RS]: Slip 1st st, ssk, pass slipped st over ssk, slip last st, pass st on the right over the slipped st.
Cut yarn and draw through last loop. Sew to top of the head and weave in ends. Using MC, cast on 12 sts. Join for working in the round. Cut yarn (leave a long tail for sewing) and draw through remaining st and pull tight. Stuff the paw end of the arm, leaving the rest empty. Sew the cast on end at an angle on the chest. Fold the arm in half, and stitch paw in place in the center of the chest with the cast-off yarn tail. Using CC2, cast on 12 sts. Join for working in the round. Round 2: Kfb around. 24 sts. Round 11: K2tog around. 12 sts. Round 13: K2tog around. 6 sts. Cut yarn (leave a long tail for sewing) and draw through remaining st and pull tight. Sew cast on end to the rear of the body, weave in ends. Using pink or black yarn, embroider nose with a few horizontal stitches, and mouth with 2 st in a V shape. Use photo as a guide. Using black yarn, embroider pupils with black yarn by repeatedly stitching in and out of the same two holes until a roundish shape is achieved. Cheezombie often finds herself bleary eyed and finger sore, but still knitting and watching slasher movies and cartoons, at 2 a.m. The byproducts of these late-night sessions fuel others, whereby creating a cycle of sleeplessness and creativity and funny critters. 1. Projects should take no longer than a few hours from start to finish. 2. Projects should have few or no seams to sew up at the end. 3. Projects should be made in one piece, or the absolute minimum of pieces necessary. 4. Projects should use the simplest stitches to get the desired effects as possible. 5. And above all, they should be quick and fun enough to knit over and over until you have little herds of funny critters following you about the house.